I boiled the beans for about 3 minutes so they would still be crisp and have that gorgeous bright green color that I love. You can of course cook them to suit your family’s liking as far as texture goes. I plunged the green beans into cold water to stop the cooking process. After that, it’s just a matter of making the dressing. The dressing is a simple homemade vinaigrette. I love homemade dressings, they’re so easy to tweak to our liking. And we love to tweak don’t we, it’s how we make a recipe ours. For example, not sure about how much honey you’d like in the dressing? Start with one teaspoon and work from there. Add or subtract to the salad ingredients to fit your families taste. An addition of feta cheese could only be a plus. Adding vine ripened tomatoes (be still my heart) would be AMAZING! The toasted walnuts (or the nut of your choice) is a must in the salad, they add so much flavor. 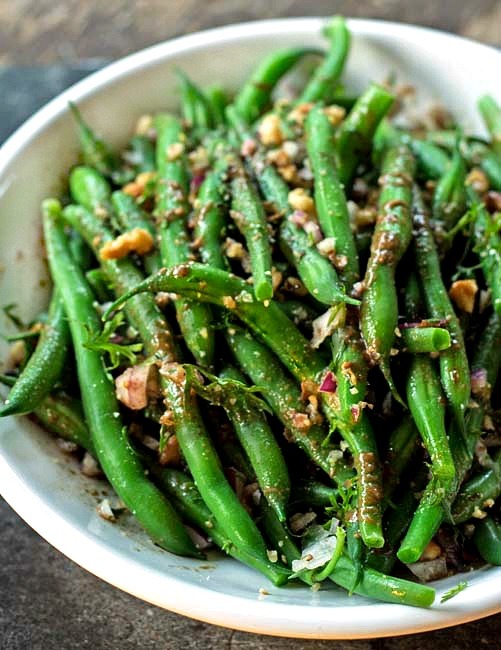 Fresh Green Bean Salad is a refreshing, delicious salad that’s perfect for the summer months. Use up the fresh veggies while they’re available kids and Enjoy! Bring a large pot of water to boiling. Add the fresh green beans to the water and cook for 3 -4 minutes. Plunge the green beans into cold water to stop the cooking. Place the walnuts into a hot saute pan and toast. Cool the walnuts, place them into a small plastic bag. Use the back of a large spoon to crush the walnuts. Add the parsley and onion to the plastic bag and shake lightly to combine. In a small bowl add the olive oil,balsamic vinegar,Dijon mustard and honey. Stir to incorporate. Salt and pepper to taste. Place the green beans in a large bowl, toss with the dressing. Sprinkle the walnuts, parsley and onion over top. Serve warm or at room temperature, refrigerate any leftovers. Try these green bean recipes from other bloggers. Always wondered how food bloggers take such beautiful and up close and personal Robin Leach style photos of dishes that makes your mouth water virtually right at the PC desk. Thank you DNN, that picture was taken with barely any natural light coming through the window. I was surprised it turned out as good as it did! Thank you Cara, you’ll love it!